Natascha Varona used digital painting to create her haunting piece about coral bleaching. Natascha Varona. The pale woman stares at you, her hand delicately placed on her cheek. Atop her head a community of corals bleeds its vibrancy. Clouds of gold and red seep into the water, joining other bits of her eroding body. Fish—stripped to their skeletons—float among the drift. The digital painting is haunting, permeated by a sense of disintegration and death. But there’s also beauty. But that life is under threat. According to the National Oceanic and Atmospheric Administration, more than 75 percent of Earth’s tropical reefs experienced bleaching-level heat stress between 2014 and 2017. And more bleaching is expected. It’s the subject of Varona’s painting but she actually studies the phenomenon with Professor Jonathan Eisen, Department of Evolution and Ecology, and visiting professor Raquel Peixoto, of the Federal University of Rio de Janeiro. Together they’re battling to preserve corals by understanding their microbiomes. 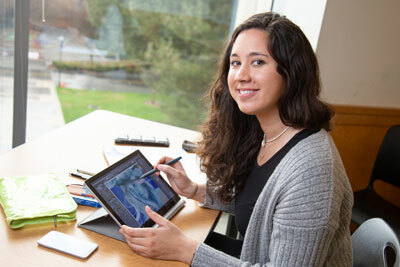 For Varona, art and science are tied together. Born to a family of artists in Germany, she split her youth between the country and San Mateo, California. Her grandmother—a painter—and her grandfather—a photographer—nurtured her artistic sensibilities by teaching her about color schemes, perspective and shading, while her father—a former surfer—nurtured her love of the ocean, taking her on trips to Half Moon Bay and the Monterey Bay Aquarium. Varona recalled going to the aquarium for the first time when she was six-years-old. It was then that Varona resolved to become a marine scientist. She wanted to find her friend in the big blue. While the specifics behind her drive to study marine science changed as she got older, the interest stuck. At Cabrillo College in Santa Cruz, Varona volunteered with Clean Oceans International, a nonprofit tackling plastic pollution. She cleaned beaches, gave talks on plastic pollution and even helped organize a cleanup trip to the Alaskan islands in Prince William Sound in 2014. Around the same time, Varona started learning about the molecular facets of biology in her college courses. There was a nesting doll-like aspect to the life sciences; organisms could be broken down into smaller and smaller observable parts. Varona became enamored with DNA, fascinated by the fact that it’s the basis for every living thing in the natural world. She honed in on corals thanks to a summer internship at UC Santa Cruz, in which she explored the effects of ocean acidification on coral skeletons with research scientist Adina Paytan. With her interest in corals piqued, Varona transferred to UC Davis prior to her junior year and sought opportunities that would allow her to work with corals again. She found a home with Peixoto and Eisen in the Eisen Lab. In order to design successful probiotics for corals, Varona and her lab colleagues are identifying the individual microbes living in symbiosis with corals. Part of Varona’s research involves finding the optimal growth conditions for coral microbes in the lab. In the lab, Varona can be found scraping coral isolates from colorful Petri dishes. Once removed, the coral bits are placed in a tube and Varona adds lysis buffer to open them up. “You can see all the different kinds of microbial colonies that are growing there,” she said. With the lysis buffer, “you break up the membranes so you can get the DNA that’s inside of the cell.” Multiple detergents and washes are then used to break down organelles to purify the DNA. Afterward, they use polymerase chain reaction techniques to amplify the sample’s DNA, which is then sent off for sequencing. “Then we can do an analysis of the sequence and figure out what the microbes are,” Varona said. A comprehensive understanding of coral microbiomes could inform design of species-specific, and perhaps even community-specific probiotics to help corals weather changing ocean conditions. Varona is on the cusp of graduation, but looking forward, she plans to take a gap year to focus on art. She wants to eventually return to academia for a doctoral degree. Through her art and science, Varona is not only raising awareness about coral bleaching but helping find solutions to the problem as well. This story was originally published by the UC Davis Department of Biological Sciences.